The other book on this web site, Unit Operations in Food Processing, covers the principles of food engineering and how they can be quantitatively applied in the food industry. Food processing involves many chemical, physical, microbiological changes during the unit operations. These changes also need to be quantitatively analysed so that the transformation of the raw materials into the final foods can be understood and controlled. 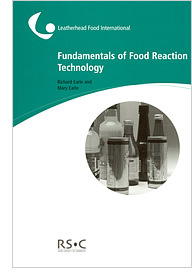 Study of these reactions is grouped under the heading of reaction technology, the subject of this companion volume Fundamentals of Food Reaction Technology. The treatment is at the same introductory level and with the same quantitative emphasis. The basic reactions are usually chemical; they are often in food processing seen as microbiological, physical and sensory changes but they can be treated as rate processes involving chemical change. They arise in foods from chemical breakdown and chemical combination affected by conditions such as the ambient atmosphere, modified by physical operations such as heat acceleration, cold retardation, mixing, and promoted by catalysts, enzymes and microorganisms. Fundamentals of Food Reaction Technology was based on New Zealand experience and teaching of reaction technology in food processing, which was combined in a text for post-graduate students and presented in southern Thailand. The present edition was written for food technologists in industry and published by Leatherhead Food International and the Royal Society of Chemistry, in Great Britain. It is essentially an introductory course in reaction technology for all interested in food technology, food engineering and food science. The two books together help the student and the technologist towards the goals of predictability and prediction. This moves the design and operation of food manufacture towards a modern industrial technology. Because understanding is limited and the books are only introductions, more information and detail may be needed in specific practical cases. But it is hoped that they will enable the wider literature to be consulted effectively, and also provide a basis for efficient experimentation that will help meet current consumer needs as they arise. The authors are grateful to all the research and development which has gradually built up over the years the knowledge needed for using reaction technology in the food industry. Some people are identified in the text, but there are many working in this area that we recognise have given us the basis for the book. Again the New Zealand Institute of Food Science and Technology is host and Chris Newey has implemented the excellent web presentation, for which we are all much indebted. © 2003 Leatherhead Food International Limited. Fundamentals of Food Reaction Technology, the Web Edition, 2008. Authors: R.L. Earle and M.D. Earle.